KGR Industries;explore the world’s largest collections of high-quality, rock tools to improve your DTH drilling productivity & performance. These products specially designed to transmit comprehensive power with the minimum possible loss of energy, henceforth improving your drilling productivity and performance while reducing costs. KGR Industries having vast experience in drilling and mining since 1992 to achieve significant technological innovations that have propelled the mining, tunneling, construction, quarrying and other civil engineering industries to the highest drilling efficiencies. 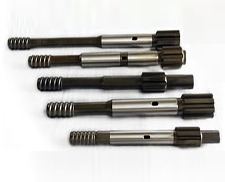 Rock Drilling Tools Exporters, KGR Industries manufacture all the tools which are related to Drilling and Mining Industries such as DTH Drilling Hammers, Cluster Hammers, Drilling Bits, Drag Bits, Udex Bits, Tricone Bits, and Friction Welded Drill Rods with higher drilling productivity and covered by comprehensive warranty policy as international standards.